With a collection that is both local and global and a dedicated team of educators and docents, the Spencer is well-equipped to advance classroom teaching and learning across a range of subjects. Learn more about our instructional resources below. Collection Cards are a series of art trading cards designed to spark and sustain curiosity about the arts. 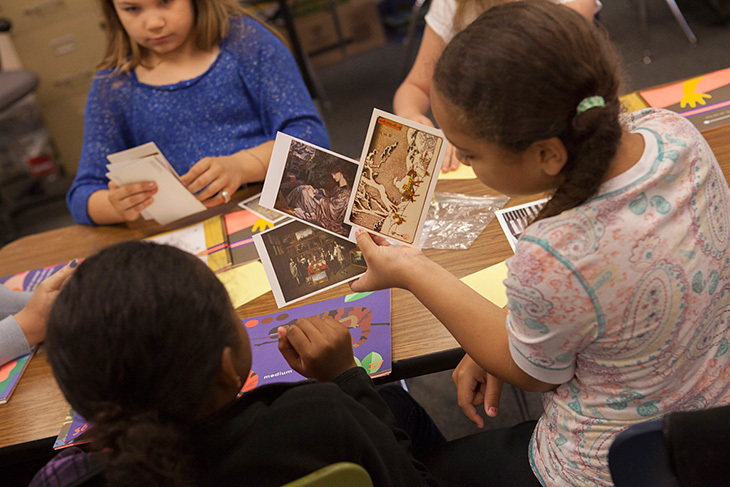 The cards complement arts education programs at the Spencer and in K–12 classrooms. Each card features a work from the Museum’s collection and a secret code that collectors can use find out more about the work of art on the Collection Cards website. Visitors can collect cards at Spencer Youth & Family events and students will receive cards during class visits. Each volume of Collection Cards features works of art related to a key theme. Collection Cards have been created with support from the Douglas County Community Foundation, the Lawrence Cultural Arts Commission, and the Kansas Creative Arts Industries Commission.